Summer means hitting the beach. Make sure you have a few essentials to feel stylish and beach-ready. The off-shoulder look you love, but in bikini form. Paired with a pop of floral print, this swimsuit is perfect for a day at the beach. Save 30% on all sale items at SwimSpot with code EXTRA30 until 6/30. If you’re headed to the beach, sunglasses are a must. These shades are retro and modern, perfect for channeling summer vibes. Take an extra 10% off everything at Neiman Marcus Last Call until 6/25 with code EXTRA10. 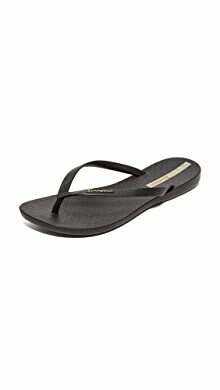 Comfortable and casual, these flip flops from Shopbop transition easily from day to night. Perfect for sand, sun, and for strolling the boardwalk.